Shawn Williams is out with an elbow injury, and while he hopes to be ready for Week 1, there’s a chance he won’t be on the field for the start of the regular season. 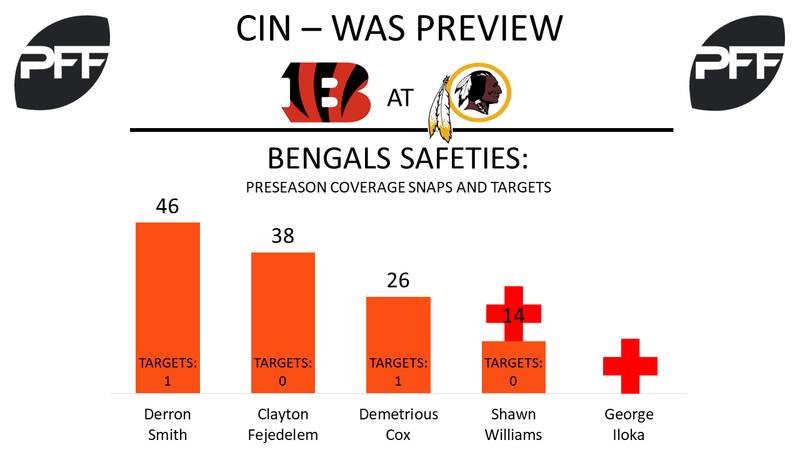 Smith has played the most snaps (86) of any Bengals safety this preseason. He’s been reliable in coverage, targeted once on 45 coverage snaps, but where he has struggled is against the run, getting blocked out of position too often on the back end. Fejedelem hasn’t been targeted in 37 coverage snaps this preseason, but he’s graded out exceedingly average this preseason. He hasn’t missed a tackle so far, but he also only generated one stop, spending quite a few of his snaps away from the ball. Chris Smith, DE – Smith is the highest graded player in the NFL this preseason, earning a remarkable 93.2 overall mark so far. He leads all edge rushers in total pressures generated, with one sack, six hits and seven hurries. His six hits is the most of any edge, and his seven hurries are tied for second. Josh Malone, WR – No Bengals wide receiver has played more snaps this preseason (47), and he’s seen his fair share of targets (6). Where he has come up short is producing with the ball in his hands, earning only eight total yards after the catch on five catches. 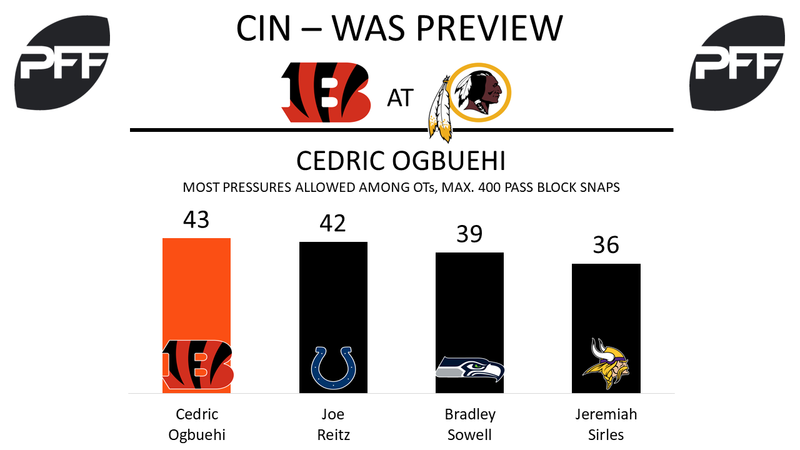 Cedric Ogbuehi, LT – Last season, Cedric Ogbuehi was one of the lowest graded tackles in the NFL (44.2 overall mark), but he moved over the left tackle this preseason and has played well so far. He has only allowed two hurries on 32 pass blocking snaps, and he’s graded out fairly well as a run blocker through two preseason games. With Trent Murphy out for the season with a torn ACL, second-round pick Ryan Anderson will get a chance to show that he is capable of a larger role at outside linebacker. The Alabama product has impressed so far this preseason, picking up a pressure on 14 pass-rushing snaps, while also notching two tackles and two stops in run defense. Also in the hunt for snaps is third-year outside linebacker Preston Smith, who returned to action last week after missing the first preseason game with an ankle injury. In his first game back, Smith tallied two pressures on 10 pass rushing snaps, including a sack. 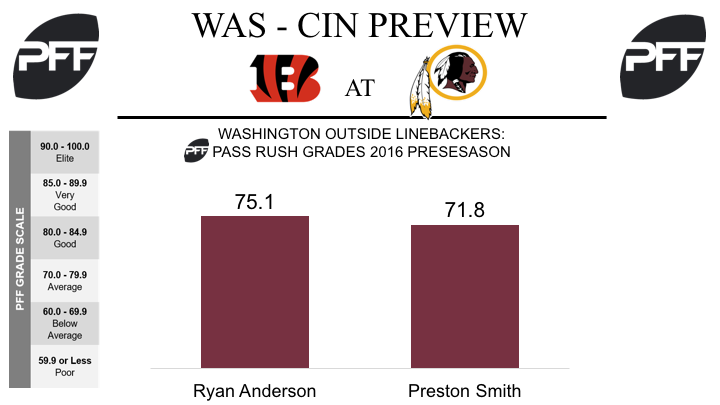 Smith will be looking to return to the impressive form he found as a rookie in 2015, where he produced 36 total pressures from 306 pass rushing snaps, and led all Redskins pass-rushers with a pass-rush productivity of 9.5. Rob Kelley, RB – The Redskins run game struggled in the second preseason game against the Green Bay Packers, and nobody will want to bounce back more than second-year starter Rob Kelley. Against the Packers, Kelley led the team in attempts (9), but ended the game with less than 9 yards. He failed to force a single missed tackle, and ended the game with a PFF overall grade of 43.0, the seventh lowest grade of the game. Josh Doctson, WR – Doctson was eased back into action last week after he missed the team’s opening preseason game through a hamstring injury. Playing with the second team offense, he caught the single catchable pass thrown his way, for 12 yards. However, Doctson is now another week removed from the hamstring injury, and should return to his place in the starting lineup. After a strong week of practice, Doctson will hope to remind people of the player that ended the 2015 college season with a PFF overall grade of 93.9 – the highest grade among wide receivers. Chase Roullier, C – Spencer Long’s absence through injury will make way for sixth-round rookie Chase Roullier, who has been impressive in preseason action. 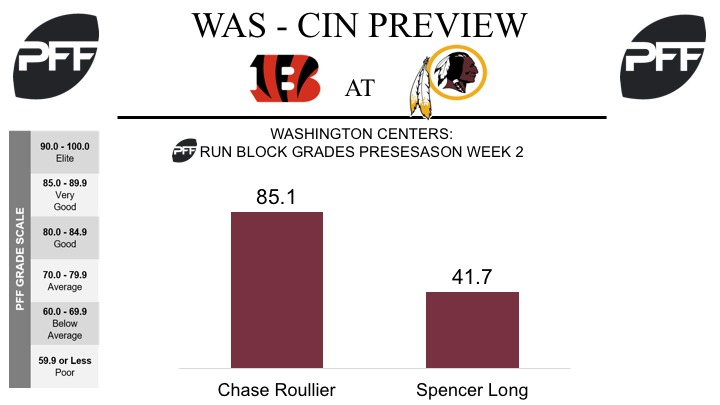 Roullier has played 56 snaps in two preseason games, and has achieved PFF overall grades of 73.8 and 81.7, ranking eighth and third among all centers in the league, respectively. His run blocking grade of 85.1 against the Green Bay Packers was the highest among all centers in the league.